2 lbs. 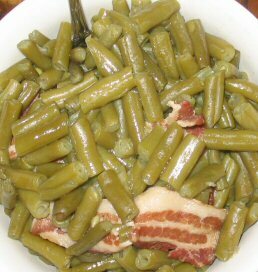 fresh or frozen cut green beans. Add hot water until beans are fully covered. Cook on medium heat for at least 4 hours, but the longer you cook them, the better they are. Drain excess water and place beans in a serving bowl.